Designed for expressing wild-type Streptococcus pyogenes Cas9 protein in mammalian cells. Cas9 is the DNA endonuclease central to the CRISPR genome editing system. Designed for easy cloning and expressing guide RNAs. gRNA expression plasmids can be edited to express 2 gRNAs per plasmid with the help of the double gRNA adaptor. Designed for expressing wild-type Streptococcus pyogenes Cas9 protein and a gRNA in mammalian cells. The ability of our plasmids to create a specific InDel and silence target protein expression is demonstrated in Figure 1 below. The disruption of RNA expression is confirmed by T7 endonuclease assay (Figure 1A) and by TIDE analysis (Figure 1B). The loss of protein expression is confirmed by immunoprobing using the WES™ automated western blot machine (Figure 1C). Figure1. CRISPR mediated gene knock-out as performed using pSF-CMV-Cas9WT-EMCV-eGFP (OG4727) CRISPR/Cas9 GFP Plasmid (SnapFast Pro™). 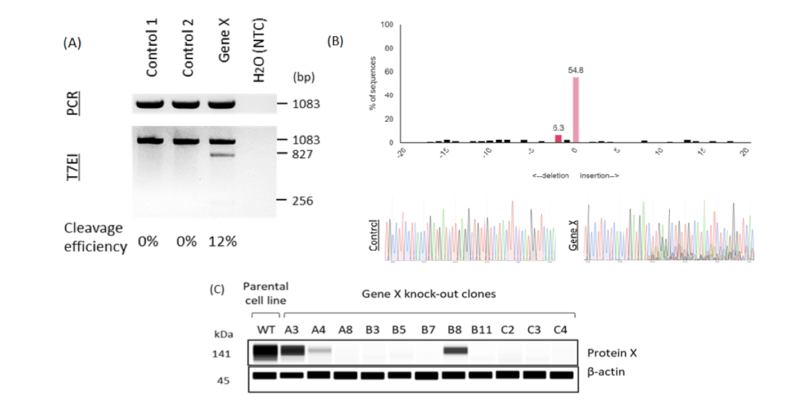 Gene knock-out confirmed by (A) T7 Endonuclease I assay, (B) TIDE analysis and (C) by WES™ analysis for loss of protein.